Objective: Test your direction skills and switch lanes every time your opponent tries to crash into you! Drive the green car and see how many laps you can make without crashing it. 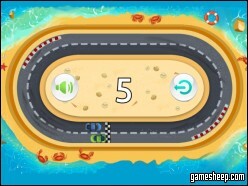 We are glad that you have chosen to play Slot Car Dodge on GameSheep.com, the most dynamic website available. If you like this game Slot Car Dodge don't forget to rate it and this way you will help with selecting only the best games for the home page.